If you love droids - and let's be honest, if you don't, we can't be friends - you'll be excited and/or irritated to know that another in an ongoing series of cute Disney exclusive carded droids is up for grabs. Only the second new one this year, R2-B00 is up for grabs at or near Disneyland now - check the stores in that general area and this green, purple, orange, and black droid can be yours for about $12.95. 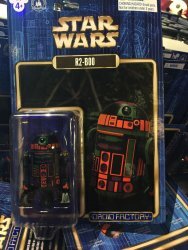 For those keeping track - so far - as of right now - no new parts in the make-your-own-droid bins have surfaced, saving you all from mild heart attacks for a litle longer. Extra special thanks to friend-of-the-site-and-also-me Shannon for the picture. It was sighted earlier this month, but time gets away from all of us. Good hunting!